Although this watch is true to Sinn's early designs, it remains as popular today as it was 10 years ago. 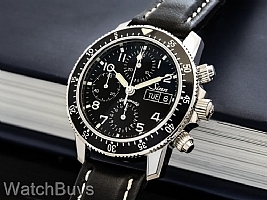 It is in fact one of the most requested Sinn watches in their aviator series. This is the classic Sinn pilot's chronograph featuring a bi-directional rotating light alloy aviation ring and black dial. The 60 minute aviation ring is contained in a ratcheted bezel system with retaining screws. Case is in polished steel with sapphire crystal. Other features include screw down crown with protective horns, domed sapphire crystal, sapphire back and water resistance to 20 ATM. Dial is matte black with Arabic numerals and luminous markers and hands. Black leather strap. Verified Owner Comments: This is truly a hard argument in value. I cannot justify a rolex, tudor, omega, or other such 'tool/diver/manly' watch. These sinns are so nice, the build quality is fantastic the watch is timeless and beautiful. 41mm is the perfect size for an average wrist, the 17mm thickness that worried me no longer does. It is thick, but the shape and placement of the band makes it look normal with just the right amount of flash. This is a heavy watch for just being on a leather band, very impressive. It wears the opposite of the look, it feels light and most of the time you forget your wearing it, much more often than my Monaco. My kids will get this watch when I die and it will still be ticking right along! "Sinn 103 St Sa on Strap"
Verified Owner Comments: Decent watch. Hands are slightly misaligned at reset which is slightly annoying for the money. Keeps good time. Verified Owner Comments: The Sinn 103 St Sa on Strap is a versatile watch. I use it for daily wear and most activities - it looks sophisticated enough to wear out to dinner, yet rugged enough for my uniform (I am in the military). The lume is bright even in light shade. The case is thicker than expected, but the finish is comfortable on the wrist and the weight is welcomed, rather than a burden. Thank you Watchbuys for an incredible timepiece that I can enjoy for a lifetime. Verified Owner Comments: I was looking for a sporty/dress chronograph on a strap, and the Sinn 103 St fits the bill. Also purchased the polished deployant buckle and it compliments the calf strap nicely, giving it a very dressy look. The customer service at WatchBuys is top notch.